Gareth Clear was biking in Sydney this past weekend with his new iPhone 6 riding shotgun in his back pocket. After taking a “minor fall,” the 36-year-old cyclist says his iPhone exploded in his back pocket, melting away his biking shorts and causing third degree burns. Clear eventually needed surgery and a skin-graft. “I just saw smoke coming out of my back pocket...and then all of a sudden I felt this surging pain,” he said, adding that he felt a “searing heat” as the phone burnt through his riding shorts in a matter of seconds. “I just remember looking at my leg and I had this black discharge all down my leg and this smell of phosphorus​,” he said. While you’d think phones would get better at not being explosive death hazards, the combination of slimmer devices coupled with consumers’ demand for longer lasting batteries can still lead to unsafe gadgets. After all, lithium ion battery contain a flammable liquid that not only explodes but explodes spectacularly. If you’re an unfortunate soul like Gareth Clear (or anyone that’s ever owned a hoverboard), then you could be on the receiving end of a skin-searing explosion. 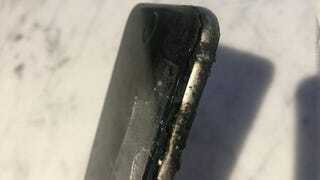 There have been several instances of iPhones exploding in the past, including one nightmare scenario where one burst into flames on a plane earlier this year. But the instances are relatively few and far between and have largely involved older iPhone models. The Herald reports that Australia only sees one or two phone explosion reports a year. According to The Herald, Apple is in contact with Clear about the incident. No word yet whether the very rich company will be picking up the hospital bill.